^ "The Real Lord of the Rings". [email protected]. 12 February 2002. Archived from the original on 19 August 2016. Retrieved 8 February 2018. Rhea is the second-largest moon of Saturn and the ninth-largest moon in the Solar System. It is the second smallest body in the Solar System for which precise measurements have confirmed a shape consistent with hydrostatic equilibrium, after dwarf planet Ceres. 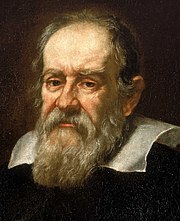 It was discovered in 1672 by Giovanni Domenico Cassini. Enceladus is the sixth-largest moon of Saturn. It is about 500 kilometers (310 mi) in diameter, about a tenth of that of Saturn's largest moon, Titan. Enceladus is mostly covered by fresh, clean ice, making it one of the most reflective bodies of the Solar System. Consequently, its surface temperature at noon only reaches −198 °C (−324 °F), far colder than a light-absorbing body would be. Despite its small size, Enceladus has a wide range of surface features, ranging from old, heavily cratered regions to young, tectonically deformed terrains. 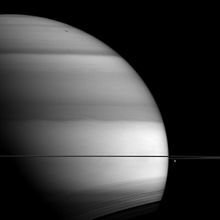 This article provides a timeline of the Cassini–Huygens mission. 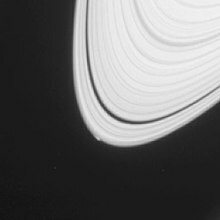 Cassini was a collaboration between the United States' NASA, the European Space Agency ("ESA"), and the Italian Space Agency ("ASI") to send a probe to study the Saturnian system, including the planet, its rings, and its natural satellites. The Flagship-class unmanned robotic spacecraft comprised both NASA's Cassini probe, and ESA's Huygens lander which was designed to land on Saturn's largest moon, Titan. 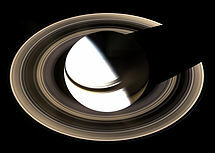 Cassini was the fourth space probe to visit Saturn and the first to enter its orbit. The craft were named after astronomers Giovanni Cassini and Christiaan Huygens. 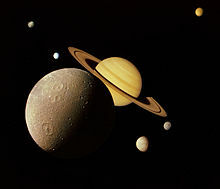 The moons of Saturn are numerous and diverse, ranging from tiny moonlets less than 1 kilometer across to the enormous Titan, which is larger than the planet Mercury. 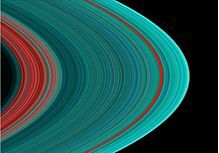 Saturn has 62 moons with confirmed orbits, 53 of which have names and only 13 of which have diameters larger than 50 kilometers, as well as dense rings with complex orbital motions of their own. Seven Saturnian moons are large enough to be ellipsoidal in shape, yet only two of those, Titan and Rhea, are currently in hydrostatic equilibrium. 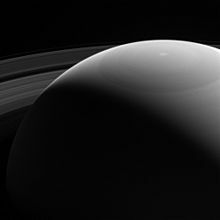 Particularly notable among Saturn's moons are Titan, the second-largest moon in the Solar System, with a nitrogen-rich Earth-like atmosphere and a landscape featuring dry river networks and hydrocarbon lakes found nowhere else in the solar system; and Enceladus since its chemical composition is similar to that of comets. In particular, Enceladus emits jets of gas and dust, which could indicate the presence of liquid water under its south pole region, and may have a global ocean below its surface. Jupiter is the largest planet in the Solar System. It has four very large satellites (moons). 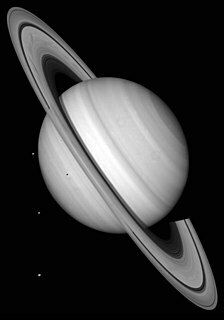 Saturn is the second-largest planet, with a large and bright ring system. Uranus is the third-largest planet and the least massive of the four outer planets. It is tilted almost onto the plane of its orbit. Neptune is the fourth-largest planet, as smallest of the four outer planets, but third-most massive. It has one big retrograde moon and many small ones. Carolyn C. Porco is an American planetary scientist who explores the outer solar system, beginning with her imaging work on the Voyager missions to Jupiter, Saturn, Uranus and Neptune in the 1980s. She led the imaging science team on the Cassini mission in orbit around Saturn and September 15, 2017 when Cassini was de-orbited to burn up in Saturn's upper atmosphere. She is an expert on planetary rings and the Saturnian moon, Enceladus. The magnetosphere of Saturn is the cavity created in the flow of the solar wind by the planet's internally generated magnetic field. Discovered in 1979 by the Pioneer 11 spacecraft, Saturn's magnetosphere is the second largest of any planet in the Solar System after Jupiter. The magnetopause, the boundary between Saturn's magnetosphere and the solar wind, is located at a distance of about 20 Saturn radii from the planet's center, while its magnetotail stretches hundreds of Saturn radii behind it. 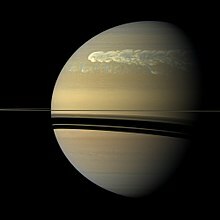 Titan Saturn System Mission (TSSM) was a joint NASA–ESA proposal for an exploration of Saturn and its moons Titan and Enceladus, where many complex phenomena were revealed by Cassini. With an estimated NASA cost of $2.5 billion (FY07), TSSM was proposed to launch in 2020, get gravity assists from Earth and Venus, and arrive at the Saturn system in 2029. The 4-year prime mission would include a two-year Saturn tour, a 2-month Titan aero-sampling phase, and a 20-month Titan orbit phase.